When Terri flew from England to New York to help plan her cousin Kate's wedding, she didn't know what she expected - but it certainly wasn't the Argeneaus. Her new in-laws may seem a little strange, with the sometimes-chipper sometimes-brooding writer Lucern - Kate's fiancee - and Vincent, the wacky stage actor (she couldn't imagine Broadway casting a hungrier looking all singing, all dancing Dracula), but having just discovered how expensive New York hotels can be, suddenly their offer of accomodation looks much more attractive. And then there's Bastien. Even taller, darker and hungrier looking than the other two, just looking into his eyes is enough to make Terri admit she's falling for him. Surely she can put up with the Argeneau's odd habits for a few days - to stay in their luxurious penthouse apartment, with the lovely Bastien - if it lets her avoid New York's blood-sucking hotel prices! 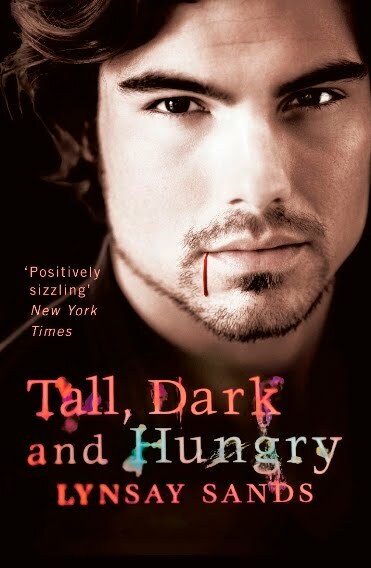 This is the third book in the Argeneau Vampire series, about a family of vampires who live in Canada. Although, this book takes place in New York. I was looking forward to Bastien's story, and it didn't disappoint. In the other books, when his brothers were finding love, Bastien seemed too self-involved in his own life, devoted to his business, and totally in control of everything. I didn't think he had the time to fall in love with anyone. But that all changes when he meets Kate's cousin, Terri. Terri has decided to come to New York a few weeks before Kate's and Lucern's wedding, so she can help Kate with last-minute preparations. Instead, she finds herself dealing with almost every vital detail of it. You see, Kate has to rush to a conventation across the country because the editor that was supposed to go had an accident. So Terri ends up staying with Bastien. As well as a few other, odd characters thrown in--the injured editor who can't stay in his apartment and needs help getting around, as well as Bastien's vampire cousin, who can't help but drink blood. Now, the bachelor who is used to being alone has a full house, and doesn't know the first thing about taking care of a bunch of humans, while trying to keep his cousin from biting them. The amount of fun that follows had me in stitches. With so much funny stuff going on, it was nice to see the attraction building up between Terri and Bastien. From pretty early on, it was obvious that they were meant to be together, and their romance is very sweet. Even if some personal experiences and fears almost manage to get in the way of true happiness. Tall, Dark and Hungry is another fun-filled installment to this series, with some very familiar faces, as well as a bunch of new ones. It was a lovely book. I had a lot of fun with it!